On 2 July 1816 Méduse ran into increasingly shallow water, both Chaumareys and Richefort ignoring signs such as white breakers and mud in the water…and Méduse ran aground 50 kilometres off the coast….The Captain refused to jettison the 14 three-tonne cannons and so the ship settled into the bank. ….A raft was soon built; it was 20 metres in length and 7 metres in width, and was nicknamed “la Machine” by the crew…. Passengers and crew panicked and so the captain decided to immediately evacuate the frigate, with 146 men and one woman boarding the woefully unstable raft, towed by the boats of Méduse. The raft had few supplies and no method of steering or navigation. Much of its deck was under water. Seventeen men decided to stay on the Méduse, and the rest boarded the ship’s longboats. The crew of the boats soon realised that towing the raft was impractical. They began to fear being overwhelmed by the desperate survivors on the raft. It was decided to cut the ropes, leaving the raft and its occupants to their fate. The lifeboats, including the captain and Governor Schmaltz aboard, then sailed away to safety. Some landed immediately on the coast of Africa, most of the survivors making their way overland to Senegal though some died on the way. On the raft, the situation deteriorated rapidly. Among the provisions were casks of wine instead of water. Fights broke out between the officers and passengers on one hand, and the sailors and soldiers on the other. 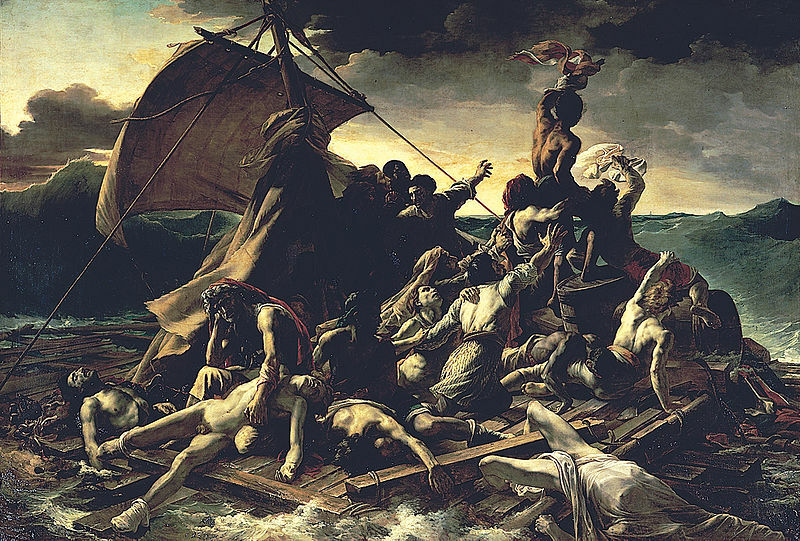 On the first night adrift, 20 men were killed or committed suicide. Stormy weather threatened, and only the centre of the raft was secure. Dozens died either in fighting to get to the centre, or because they were washed overboard by the waves. Rations dwindled rapidly; by the fourth day there were only 67 left alive on the raft, and some resorted to cannibalism. On the eighth day, the fittest began throwing the weak and wounded overboard until only fifteen men remained, all of whom survived until their rescue on 17 July by Argus, which had accidentally encountered them. Argus took the survivors of the raft to Saint-Louis to recover. Five of them, including Jean Charles, the last African crew member, died within days…. Three of the seventeen men who had decided to stay on the Méduse were still alive 54 days later…. The matter became a scandal in French politics and officials tried to cover it up. At his court martial at Port de Rochefort in 1817 De Chaumareys was tried on five counts but acquitted of abandoning his squadron, of failing to re-float his ship and of abandoning the raft. However he was found guilty of incompetent and complacent navigation and of abandoning the Méduse before all her passengers had been taken off. Even though this verdict implied the death penalty, De Chaumareys was sentenced to only three years in jail.